Toyohara Kunichika (1835-1900) Thirty-six Good and Evil Beauties: Onmyoji, 1876. Oban. The Thirty-six Good and Evil Beauties is probably Kunichika’s finest large series and certainly the best bijin series of his career. The quality of the printing is outstanding, the drawing is fluid and original and the designs bristle with invention and startling use of colour and pattern. Each print from the series takes a famous woman of history and portrays her beneath a cartouche explaining her story. Some of these characters are warlike, some evil and vain and some are pious or devoted. What is interesting historically is how Kunichika presents women as individuals and not archetypes. This is at variance to the traditional bijin portraits of pliable or available females and chimes with Yoshitoshi’s series on similar themes such as Thirty-two Aspects of Customs and Manners from 1888. This particular print is a mystery. Some academics refer to the subject as an onmyoji or sorcerer which is unlikely since onmyoji were always male. The MFA in Boston refers to the print as Kaide no kata whilst Amy Riegle Newland in her book Times Past and Times Present: Images of a Forgotten Master refers to her as ‘That Person Ohide’ (Ohide no kata). Unfortunately there’s little or no information available on either of these women. 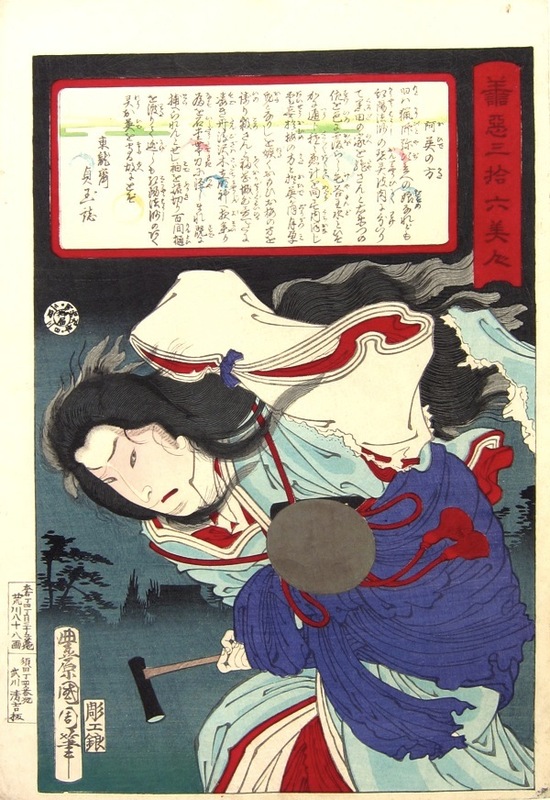 Our own research suggest that she might be Shizuka Gozen, mistress of Yoshitsune (the 12th century samurai general) to whom he gives a drum of fox skin as a keepsake (seen here around the neck of the woman, and the hammer in her right hand) and which saves her life when fleeing the retainers of Yoshitsune’s half brother. This print is magnificent; it is a rare full sheet size and displays Kunichika’s address and family name on the left hand margin. Very fine colour, condition and impression. Signed Toyohara Kunichika hitsu with Toshidama seal, published by Morimoto Janzaburo. The print is illustrated on page 19 of Newland, Time Past and Time Present: Images of a Forgotten Master, Hotei Publishing, 1999. A copy of this print is in the collection of the MFA Boston.